haverhillchamber.com | Haverhill New Year’s Eve Party Caps off the 375th Celebration! Haverhill New Year’s Eve Party Caps off the 375th Celebration! New Year’s Eve is only a couple weeks away, and the 375th Committee could really use your help to spread the word about our upcoming New Year’s Eve party! We have an incredible evening planned with some fun surprises and we would LOVE for you to attend. It could be a fun night out for a group of friends, a date night, or a great way to thank your staff for their hard work this year! We’ve booked a top-notch DJ, and a flip-book photo studio for a unique keep-sake. Listen, if you can’t make it to the party we totally understand! But would you mind sharing out the details to your friends and family? You can do that by sharing this email, posting the flyer (attached), or sharing the Facebook event on your personal and business pages. We really want to pack the house for the final 375th anniversary celebration! 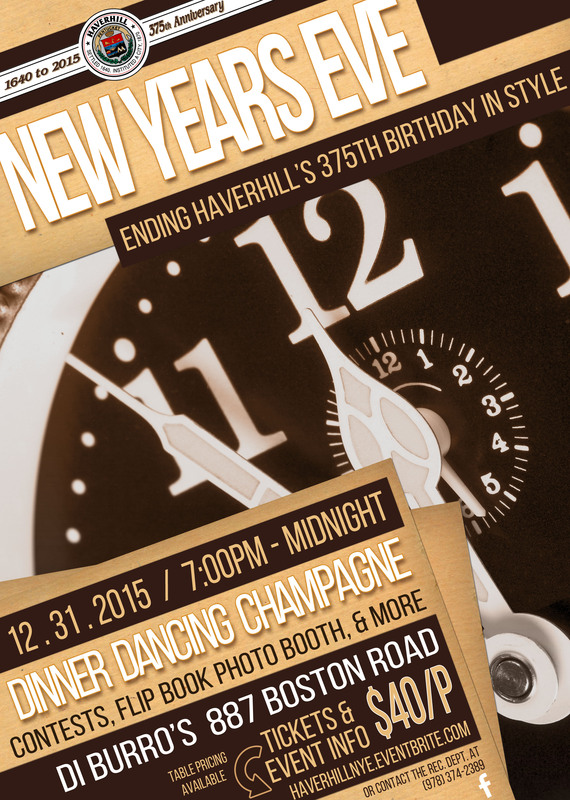 Haverhill’s 375th New Years Eve Bash! Your ticket includes buffet-style appetizers (chicken fingers, crab rangoon, stuffed mushrooms, scallops wrapped in bacon, cocktail meatballs), dinner- carving stations (turkey, steamship round) and dessert. You’ll also receive a special 375th anniversary favor to mark the occasion during the champagne toast at midnight. This is an evening you won’t want to miss!